From the Cumberland Gap to the Atlantic Ocean, this is Virginia Water Radio for the week of January 12, 2015. This week, we feature a Blacksburg- and Roanoke-based musical group, with a tune whose name and note patterns recall how rivers and streams follow laws of energy and physics. Have a listen for about 40 seconds. 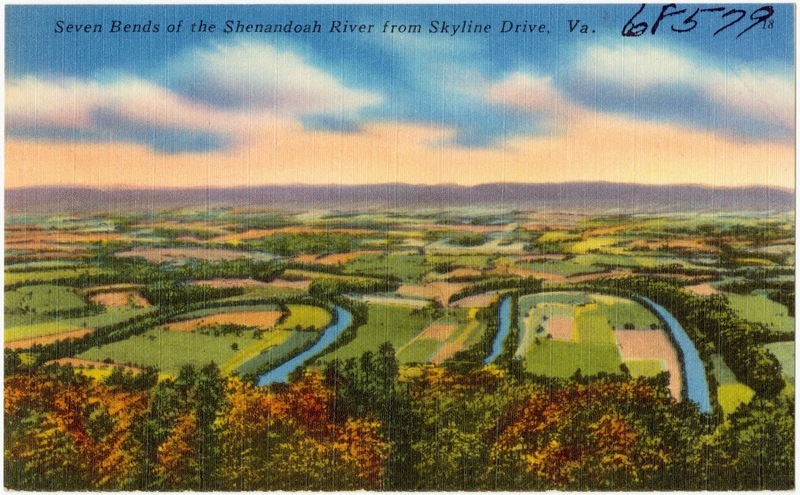 Post card image (dated between 1930 and 1945) of part of the Seven Bends of the North Fork Shenandoah River, in Shenandoah County, Virginia. From the Boston Public Library, made available (for uses allowed under Creative Commons Attribution 3.0 License) by the Digital Pubic Library of America, online at https://www.digitalcommonwealth.org/search/commonwealth:2z10wt39r. 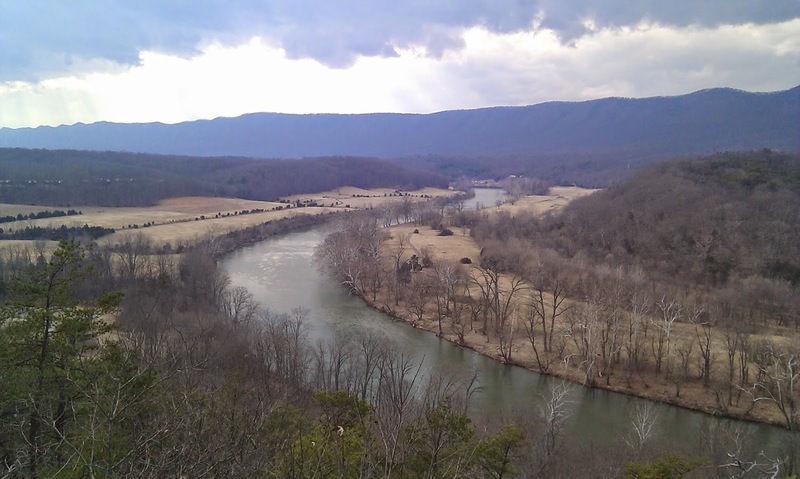 Meanders in the South Fork Shenandoah River, as seen from Cullers Overlook in Andy Guest/Shenandoah River State Park (Warren County, Va.), March 12, 2014. “Minor Meander” and “In the Vinyl Tradition Volume II” are copyright by No Strings Attached and Enessay Music, used with permission. “Minor Meaner” was composed by Wes Chappell and appeared originally on No Strings Attached’s 1986 album, “Dulcimer Dimensions.” More information on No Strings Attached is available from their Web site, http://enessay.com/. Thanks to Kevin McGuire, associate director of the Virginia Water Resources Research Center, for his help with this episode. Encyclopedia Britannica, “Meander,” online at http://www.britannica.com/EBchecked/topic/371575/meander. Stream Hydrology: An Introduction for Ecologists, by Nancy D. Gordon et al., John Wiley & Sons, Chichester, England, 1992. Virginia Department of Conservation and Recreation, “Seven Bends State Park: 2008 Master Plan Executive Summary and 2014 Master Plan Renew,” accessed online at http://www.dcr.virginia.gov/recreational_planning/masterplans.shtml. U.S. Geological Survey (USGS) “Water Science School,” online at http://water.usgs.gov/edu/. This episode may help with Virginia’s January 2010 Science Standards of Learning (SOLs) for Force, Motion, and Energy in grades 4 (4.2) and six (6.2); for Earth Patterns, Cycles, and Change in grade 5 (5.7); for Matter in grade 6 (6.5); for Living Systems in grade 6 (6.7); for Life Science (especially LS.6); for Physical Science (especially PS.6 and PS.10); for Earth Science (especially ES.8); and for Physics(especially PH.4, PH.6, and PH.7).